The Epson TM-C7500G color label printer is the “gloss” version of its popular ColorWorks C7500 printer. This color label printer blends the durability of pigment-based inks with the aesthetic of glossy media to produce durable, high resolution, full color product labels. The Epson ColorWorks C7500G uses glossy media and specially formulated pigment inks to produce attractive, high gloss product labels that won’t smudge, smear, or fade. These inks dry on contact, which is crucial for high volume print environments. The Epson TM-C7500G prints at 11.7 inches per second and has a print resolution of 1200dpi. It comes with a built-in unwinder. An optional rewinder is available should you want to use it as a mini label press for roll-to-roll printing. The Epson TM-C7500G label printer is commonly used to print product labels such as baked goods labels, coffee and tea labels, jarred food labels, wine bottle labels, beer labels, water bottle labels, toiletry labels, perfume labels, cosmetic labels, and more. A dedicated Windows driver comes with the Epson TM-C7500G and is compatible with NiceLabel, BarTender, and CodeSoft label design software. Who Should Buy the Epson TM-C7500G Label Printer? •	High speed, high volume color label printing – The ColorWorks C7500G can quickly print hundreds and thousands of labels at a rate of nearly 60 feet per minute. •	Smudge-free glossy labels – Because the Epson TM-C7500G uses pigment-based inks formulated for use with glossy media, the ink dries right away without smudging or smearing. Unlike dye-based inks, the colors won’t wade over time. 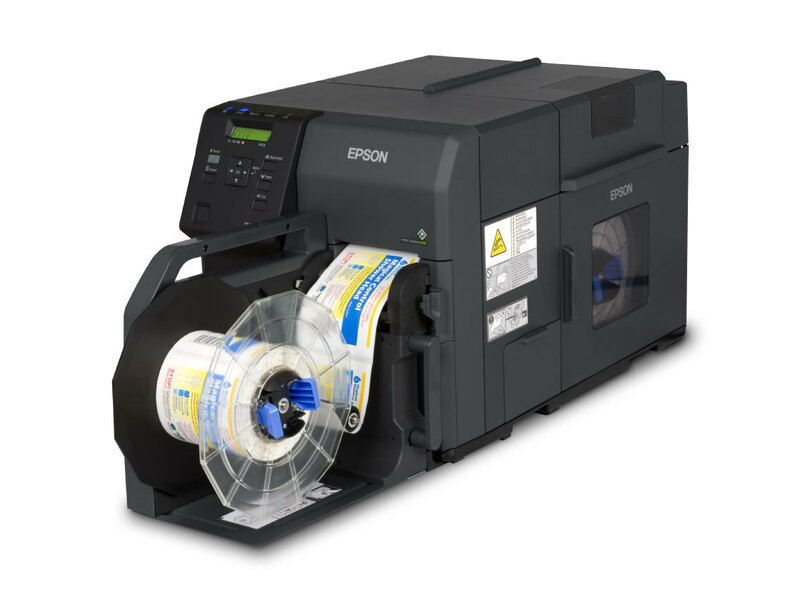 •	Versatility – The Epson TM-C7500G can be used to print a variety of labels including product labels, nutrition labels, barcodes, office labels, retail labels, and more — all on glossy media. 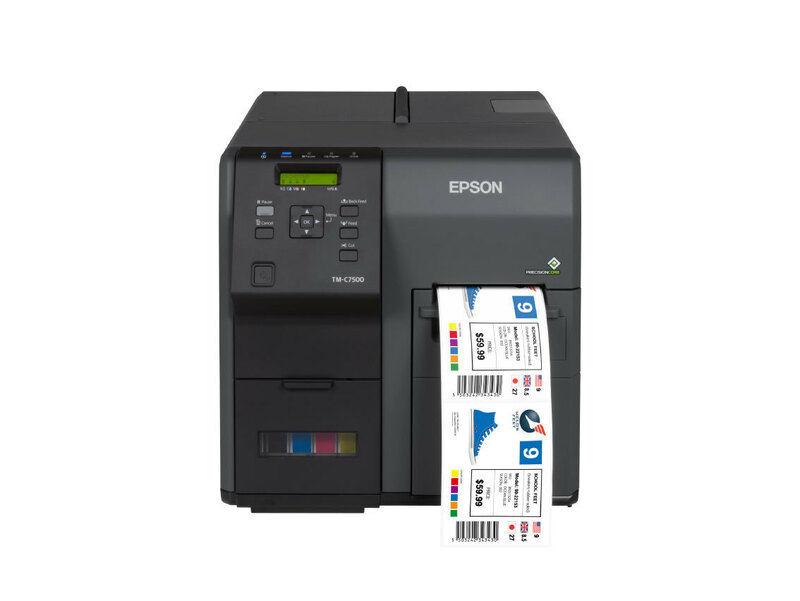 •	Low operating cost – The Epson TM-C7500G is affordable to own and operate. It uses four individual ink cartridges to minimize waste and offers lower costs than comparable thermal transfer and color laser label printers on the market. •	Muted colors – The ColorWorks C7500G uses pigment-based inks, which tend to be more muted in color than dye-based inks. Thus, color labels printed on the Epson TM-C7500G won’t be as vivid as those printed on a dye-based inkjet. •	Printer cost – This color label printer has a retail price of $8499, which means it’s not an entry-level label printer or something you buy on a whim. It is an excellent upgrade that can quickly pay for itself, however, if you’ve outgrown an entry-level color inkjet with high replacement ink costs. •	Limited label width – The max label width for the Epson TM-C7500G is 4.25, which is great for printing food and beverage labels and many other product labels but not suitable for larger products requiring wider labels. The Epson TM-C7500G label printer currently retails for $8499 USD. The ongoing costs for the Epson TM-C7500G include consumables such as ink cartridges and blank labels. You’ll also need to replace the maintenance box periodically. However, there’s no need to replace the print head, saving you potential thousands of dollars each year. The print head in the Epson TM-C7500G is good for the printer’s life. The Epson TM-C7500G is one of three ColorWorks C7500 models from Epson. Here’s how they compare. •	Epson TM-C7500G (Gloss) – Prints on glossy media to produce attractive product labels. •	Epson TM-C7500GE (Graphics Edition) – This model includes the Epson TM-C7500G glossy media printer but is bundled with graphics software (Wasatch SoftRIP plus Wasatch tech support for six months) and Epson’s onsite service warranty for one year. 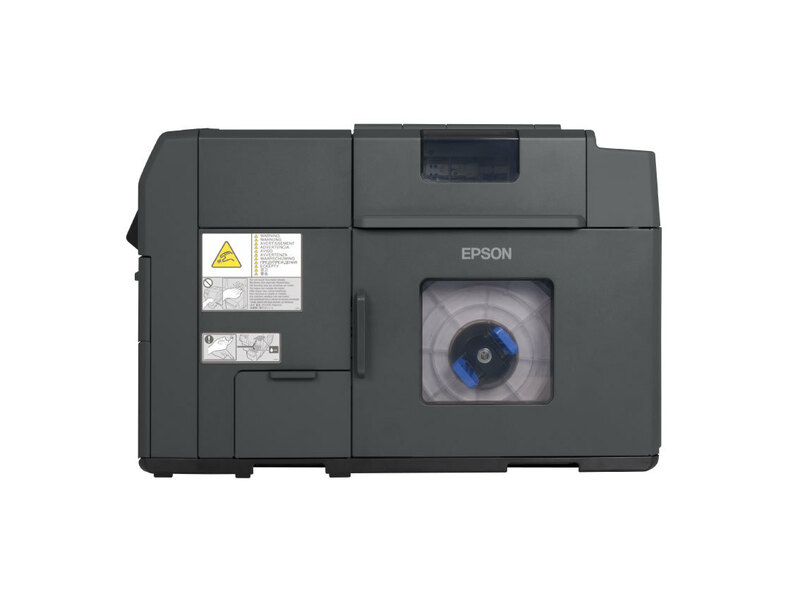 •	Epson TM-C7500 (Matte / GHS) – This model is identical to the Epson TM-C7500G with the exception of the inks used. It uses traditional pigment-based inks for use with matte media only. It is a GHS BS5609-certified color label printer that can produce the most durable labels available when used with BS5609-certified media. DuraFast Label Company sells all three versions of the ColorWorks C7500 across the United States and Canada. Currently, DuraFast Label Company is offering an exclusive deal on the Epson TM-C7500G where you can get up to $500 worth of free labels with your purchase (when ordered via DuraFastLabel.com and with the discount code C7500G) and another batch of $500 in free labels after submitting a printer review when initiated by Verified Reviews about a week after your order. The Epson TM-C7500G is an excellent, cost-effective color label printer for businesses that print 3,000 or more labels per month. When you factor in up to $1,000 in free labels and competitive financing from DuraFast, buying directly from DuraFastLabel.com is the smartest choice.